Last year, it was Brian Hoppe, Erik Darnell and Zach Niessner. These were the outsiders that came into the NASCAR Southeast Series from other divisions and stole the show from the SES regulars. 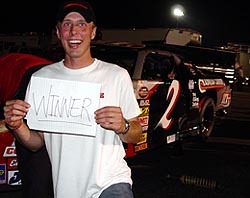 Midwest Series driver Hoppe won the 2004 opener at Nashville. 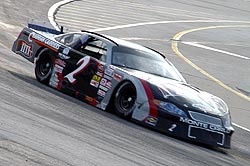 Niessner, who has raced in all four NASCAR divisions over the last couple years on a part-time basis, came in and stole the last race at Nashville. Then there was Darnell. Darnell won a race with SES, but calling this Midwest-native an outsider was a little different, because he opted to run the entire SES schedule, along with almost the entire MWS schedule. Bring on 2005 and bring on Justin Diercks. Diercks, the former MWS Rookie of the Year and defending MWS Champion, decided that he was going to do a little invading himself this year. He ran the first SES race of the year last weekend at Greenville, SC and finished in the top 10. Not great, but not bad considering how tough of a track Greenville is. After Greenville, plans were sketchy on if the team would make the long trip from Iowa down to Houston just a week later for the second SES race of the year. After a little deliberation, they decided to come. 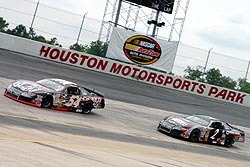 Diercks got to Houston and returned to his championship form, winning the pole and storming through the field from his eighth-place starting spot (after the invert) to lead the final 28 laps and capture his first career Southeast Series victory at Houston Motorsports Park on Saturday night. “I am definitely happy that I made the trip down here now,” said Diercks, who also won the Midwest Series opener at Rockford (IL) earlier this year. “My mom wanted the trophy for Mother’s Day and that is what we got her. It makes the guys that took the time to drive the truck down here appreciate doing it and worth while. The added expense of flying down here and everything else a trip like this takes; it makes it all worth it. It is a great facility and these are great fans. It has made every minute of this worth it. Diercks had a great call all weekend at the very tight, one-groove 3/8-mile in Houston. It was a track that more closely resembled something from the Midwest, comparative to the flat, half-mile of Greenville just a week ago and it showed. Diercks was quick in practice and then came out and clocked in the only sub-14 second run in qualifying, earning him the Bud Pole. After drawing an eight for the invert, Diercks mission was on. Get to the front. Get to the front in one piece. Win the race. Fultz, leading the three-car charge from the back, made it around Williams on lap 82 and brought Diercks and Hogan with him. The three then broke away from the rest of the pack, with Fultz pulling out to an even bigger lead. However, around lap 115, sparks began to rain from underneath Fultz’s car. As laps continued on, the sparks got worse. Eventually, on lap 123, Fultz’s left front tire finally went down, handing the lead over to Diercks with Hogan in hot pursuit. Fultz (#54) pulled away from Diercks (#2), but tire problems forced Fultz out of the running late. here and there. With the preferred groove on the bottom, everyone fought to get there and lots of bumping and banging was the result. While Diercks, Hogan and Fultz came to the front, there were plenty of other leaders. Local racer Kenny Bumbera started on the pole and led the first 11 laps before contact from Justin Wakefield sent him spinning. 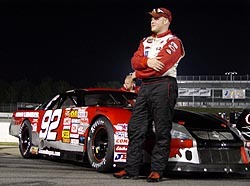 Dusty Williams then spent plenty of time at the front of the field before getting passed by JR Norris. Just a few laps later, Williams reinherited the lead after Norris lost it going into one and two and backed his car hard into the outside wall, ending his night. After the trophies couldn't be found, Diercks and Speed51.com improvised to get a Victory Lane shot. Now a two-car race, Hogan started applying the pressure to Diercks with just a handful of laps to go. Several times, Hogan was underneath Diercks, but he couldn’t’ complete the pass. There was plenty of beating and banging between the two, but it was all done very cleanly. Then, a late-race caution on lap 143 set up a green-white-checkered shootout, which all-in-all handed the win to Diercks. Diercks cruised those laps few laps and cruised on to his first career SES victory. So would the other Midwest drivers be jealous of Diercks accomplishments? For Hogan, the second-place wasn’t a win, but it was enough, coupled with his third at Greenville last week, to give him the early points lead after two races over Justin Wakefield and Diercks. “Man, what a wild race,” said Hogan. “There were guys beating and banging, leaders spinning out. It should have been exciting for the fans. The game plan from the beginning was to get behind Fultz or for him to get behind me and go to the front. We went to the front in the hurry; a lot quicker than I expected to go. could have had him. I didn’t need that last caution. I spun the tires a little bit, heated them up and they were just trash for about four laps. My car was really good on the long runs tonight. It wasn’t real good on the short stuff. That is just part of racing. We just didn’t quite get to him. “Man, he raced me clean and I raced him clean, so that was fun. Williams came back to finish third, with Wakefield fourth and Greg Pope fifth. Jason Hogan is now the SES points leader after two races.